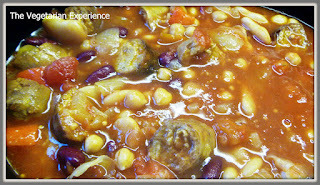 Today I am featuring one of my own original recipes on the blog - a delicious bean and vegetarian sausage casserole. 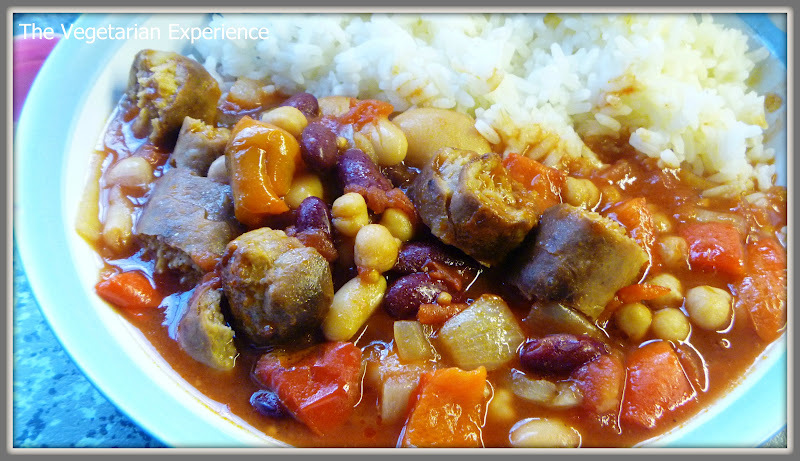 The weather has not been kind to us lately, even though we are now in spring, and so I have dusted off the slow cooker once again to create some warm, hearty food for the family. I love this bean and veggie sausage casserole as I love the colours of the different ingredients and I think it is so full of nutrients. Beans can help lower your cholesterol and protect against heart disease. They are also very filling as they are full of protein and fibre. In addition to being kind to the purse, kidney beans are also a great source of natural minerals like iron. copper, phosphorus, magnesium and potassium. I tend to buy canned beans rather than dried beans as I find that dried beans take so long to prepare, they are often just not practical in every day cooking. Apparently we should include around three U.S cups of beans a week in our diet and so this casserole definitely sets you on the way to reach that target. The Quorn sausages are a also a good form of protein for vegetarians and I like using them as they don't break up as other sausages do, but you could use an alternative if you wished. I added apricot jam to sweeten this dish, but you could also add a tsp or two of sugar instead if you wished. Often I think we are slightly worried about adding sugar to our food - well I know that I am anyway, but glucose is essential to our diets for energy and so I think sometimes it does help to add sugar to a dish as long as you moderate the amount being added. I hope you enjoy this dish. It really is a wonderful vegetarian meal. I will be entering this dish into the Slow Cooker Linky over at Mediocre Mum's blog. What veggie slow cooker recipes do you make? Gently fry the onion, pepper and garlic until the onions are transparent and have softened. Place the kidney beans, chickpeas, borlotti beans, butter beans, tomatoes, mustard seeds, and cumin in the slow cooker and stir to combine. Once the onion and pepper have cooked, drain the oil from them and add them to the slow cooker. When the sausages are cooked, chop or cut them into small pieces and add them to the slow cooker. Stir all of the ingredients again to combine well. Stir once more and then adjust the flavouring to your liking. Add 2 tbsp of the apricot jam if you like a sweeter flavour, or one or none if you don't. 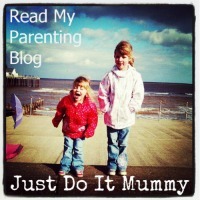 My kids like a sweeter taste which is why we add the jam. You could also add a couple of tsp of sugar to sweeten if desired. Cook on high for 3 to 4 hours, or on low for 6 to 8 hours. Serve with rice, potatoes, bread, or another accompaniment. This looks so tasty Clare, thanks for sharing! This looks fantastic Clare! I want to make this immediately but I have two queries now- How many people does it serve and what veggie stock did you use/do you prefer?